Hot Stuff is a band comprising young, enthusiastic professionals in the music industry who deliver the finest quality of live music there is to offer. Every song in the repertoire is carefully chosen to ensure a magical flow to keep the dance floor electrified, while delivery of an exceptional standard is guaranteed. Hot Stuff's dynamic team of young enthusiasts go the extra mile to insist that all performances are energetic, interactive and completely live, producing a tailored performance which gives you and your guests an evening to remember. If you are seeking non stop, dance floor filling party tracks, Hot Stuff will deliver nothing short - the best hits from the 60?s to the current chart sensations. However, reception music and dinner jazz also lie within their strengths too if required. Hot Stuff is the ideal wedding band, covering the widest possible range of mjsic to keep everyone happy and on the dancefloor all night. Corporate events are also a speciality and many of the UK's leading charities have alreaduy benefited from Hot Stuff's amazing show, to wow their guests at charity balls. Collectively the band has acquired a phenomenal amount of experience in the entertainment business, working with and for some of the world's elite. As well as providing music of the highest quality and a party atmosphere that is to be unrivalled, Hot Stuff prides itself on displaying a young, stylish and professional image on stage which is complemented by the bands own lighting and sound system. 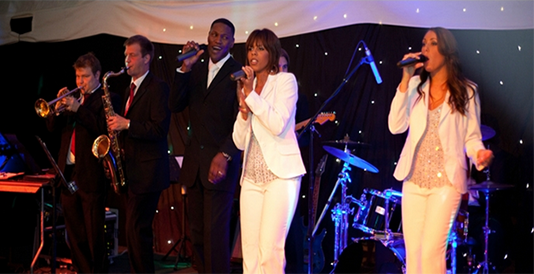 Whether yours is an intimate event or a large scale function, the band can be tailored to suit your needs. Hot Stuff can augment their line-up from a seven piece (with drums, bass, keyboards, guitar, 1 male & 2 female vocalists) to a full complement of eleven featuring brass and percussion. Lead vocalist and bandleader Jon Constables believes that the audience are a vital part of any performance and will welcome or initiate all round participation with you and your guests. Hot Stuff - a fabulous party, every time.